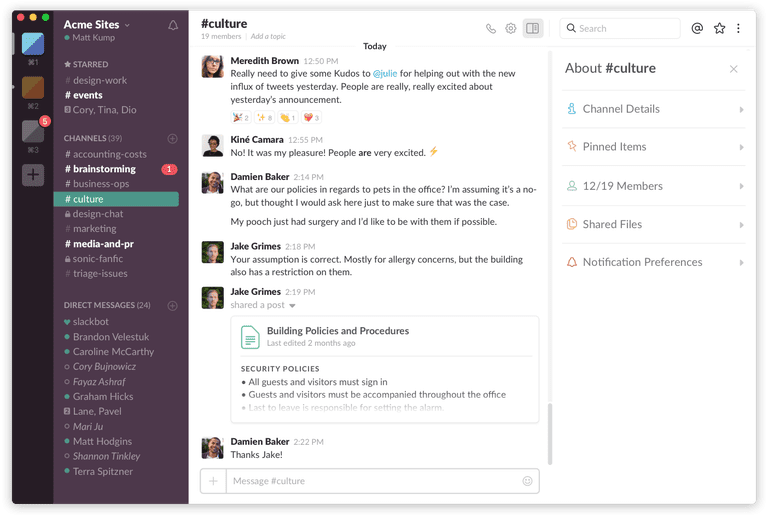 If you work as part of a large team, chances are you've heard of the messaging service Slack. This web-based or desktop-based software is made for team collaboration, and it aims to do away with back-and-forth emails with long reply times by hosting all your work-related discussions in a variety of customizable "channels" (or chat rooms). It's not the only service of its kind — there's also Hipchat, for instance — but thanks to its many features Slack is probably the most popular. Whether you're already using this platform to communicate with your coworkers or are currently trying to evaluate whether or not it makes sense for your team's needs, the following tips will ensure you know all of Slack's ins and outs. You might be surprised just how much you can do — and how much fun you can have, even — with this dynamic platform. The following tips are all about streamlining your workflow and taking full advantage of Slack's interface to get things done as an individual, while the next section will tackle group productivity features. Create a to-do list: Chances are you'll be discussing plenty of actionable items with your coworkers and managers in Slack, but what about keeping track of them all? The service has a nifty way of keeping things organized: Just star a message that contains info about a task you need to work on, and it will be saved to the Starred Items list. You can access this from the top right-hand corner of your Slack screen, and once you've completed a task, you can simply un-star it to remove it from the list. Integrate other services from Google, Twitter and more: Slack has a pretty impressive selection of services and tools that can be integrated with its platform, including some heavyweights you likely already use. You can integrate Google Docs to import files directly to Slack without having to leave your conversations (just post a URL from Docs and it will become a file), and you can add integration with Twitter to automatically post tweets into a specified channel and automatically expand tweets to show attached media and the full details. Other integration options include Zenefits, SurveyMonkey and Google Hangouts — and there are dozens more. Hover over the upper left-hand portion of your Slack window and click on "Apps and integrations" to be taken to the full list of available tools you can integrate. ​Get notified when certain words are mentioned: Make sure you never miss a message related to the topics you care about by setting up alerts for when a certain word is mentioned. You'll find this option under "Notification Settings" in your Preferences menu. Your username is automatically included as a Highlight Word, but you can add any additional words you don't want to miss as well. Customize your notifications settings: You likely don't need to get a ding every time a new message appears in Slack, but you might want to receive an alert if your name or a specific word is mentioned. Configure your preferences — and even turn notifications off completely — by going to your Preferences menu and navigating to the Notifications page. Set yourself as away or specific your status: Make sure your colleagues know you're actually away from the computer or phone and not just ignoring their messages by designating your status as away. You can do this from the drop-down menu on the upper left-hand side of your Slack interface. Clicking it again will undo it. From this same menu, you can also set a status from a list of preset suggestions — such as "in a meeting," "commuting" and "out sick" — or type in your own one. Save time with keyboard shortcuts: The power users out there can really get geeky by drilling into this list of keyboard shortcuts. Jump between channels quickly — Slack's Quick Switcher tool is a nifty shortcut for moving between various channels. To activate it, hit Command+K or Command+T on a Mac, and on a Windows PC use Ctrl+K or Ctrl+T. Then, use the arrow or type to move between channels, and once you've found the one you're looking for, press return. Remember that you can edit messages: Sent something too soon, or simply spelled something wrong? You don't have to let your message sit there uncorrected; hover over it to edit and correct your mistake. It will show that your text has been edited, but it's definitely better than nothing. Make separate channels for different discussions and topics: This is one of the more basic tips, but it's worth emphasizing because it can go a long way in keeping your communications streamlined. While most teams have a main Slack room where everyone can talk with each other, the service also lets you create additional "channels" — and you can limit them to certain team members, and can even hide them so the larger team can't view them. The purpose here isn't to create an "in crowd;" it's about tailoring channels to the most relevant members and making sure you aren't filling up people's screens with messages that don't concern them. You'll find the option to create a new channel on the left-hand side of your Slack window — simply click on the + and then create a channel name, select which team members you'd like to include and decide whether or not you want the channel to be public. Use the Threads feature to make it easy to follow a conversation: Much like email threads make it possible to view a long back-and-forth conversation relatively easy to follow, the Threads feature on Slack provides a handy way to see an entire discussion about one specific topic. To initiate a thread, hover over the message you'd like to respond to and select the text blurb icon (hovering over this icon will display the text "Start a thread"). Once you reply to a thread, you'll automatically be following the conversation — if you want to follow the thread but don't want to contribute any messages, you can hover over a message and select "Follow this message." The same process applies for un-following a thread that is no longer relevant. Refine your search results: Especially if you have a large team that communicates through Slack all day, every day, it can be hard to go back and find a specific message. If you're searching for something, narrow down your results by using Slack search modifiers. For example, if you're looking for a message from a specific person, add "from:" to the beginning of your search and type in that individual's username. If you remember the date of the message in question, type "on:" and then the date, month or year to narrow down the search to that specific timeframe. Believe me, these modifiers will definitely come in handy when your team logs hundreds of messages a day! Mark messages as unread: The ability to mark an email as unread can mean the difference between remembering a task and letting it fall by the wayside, and the same principle applies to Slack messages. If you want to make sure you don't forget a specific Slack message, click on it and hold down the Option (Alt) key to mark it as unread. Auto-post tweets to a Slack channel to stay up on the latest news: Whether you work for a news publication and don't want to be surprised by what the competition posts or you simply want to keep on top of the latest headlines, consider setting up a Slack channel with the sole purpose of posting tweets from a specific account. Add Twitter from the list of integrations at slack.com/services to do this. Even if you're working remotely, Slack lets you build camaraderie with your team through a variety of fun customizations. They aren't always conducive to getting work done, but, hey, you have to have some fun too, right? Create your own emojis: In addition to the standard set of emojis available to Slack users, you can make and use your own custom ones. Go to the "Customize" page of your Slack interface, then upload an image and give it a name. Now, it will show up alongside the other already available options when you go to select an emoji from the menu. (Kindly) troll your colleagues with Slackbot: Slackbot is a virtual assistant of sorts that will alert you when you've been invited to a new channel and can answer your questions about various features of the service (you'll find Slackbot as a contact under the "Direct Messages" list on the left-hand side of your screen). On the less productive side of things, Slackbot can also be configured to respond to specific words or phrases with a specific message. For example: In one Slack room I belong to, one of my team members has configured Slackbot to reply "gross" whenever sushi is mentioned as a potential lunch option. As with the customizable emojis, you'll find this option on the "Customize" page of your Slack interface. Just click over to the Slackbot tab to get started. React to specific messages with emoticons: Take your emoji game to the next level by adding reactions to specific messages with your smiley of choice. To do so, simply hover over the message in question, click on the smiley with the plus sign next to it and pick your emoji. Use the shrug command: Let's face it: Certain moments call for the famous shrug emoji. Rather than laboring over your keyboard trying to type it out manually, simply type /shrug to produce it.